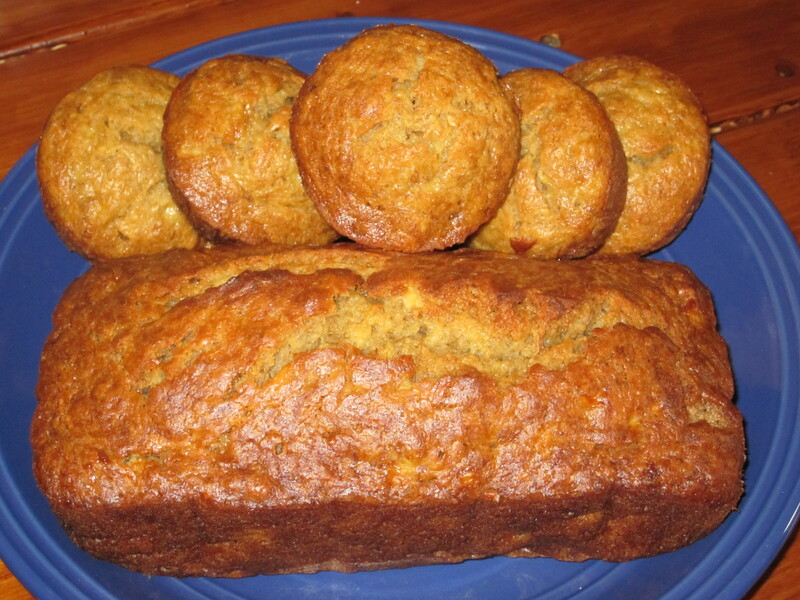 Banana Banana Bread and/or Muffins | This Girl’s Gotta Eat! Talk about banana-packed flavor! This recipe from All Recipes makes moist and delicious banana bread. Depending on your preference, you can follow it as is, or add nuts. Preheat oven to 350 degrees and lightly grease (or use non-stick spray) a 9 x 5 inch loaf pan. I decided to use a smaller loaf pan in combination with a medium size muffin tin so I ended up with bread and muffins. In a large bowl, combine flour, baking soda and salt. In a separate bowl, cream together butter and brown sugar. It’s easiest if you do this in a mixer or using a hand-held. Next stir in eggs and mashed bananas until well blended. Stir banana mixture into the flour mixture; stir just until moisten. Pour batter into the prepared loaf pan / muffin tin. If you follow the original recipe and use a 9 x 5 loaf pan, you’ll want to bake for 60 – 65 minutes. You’ll know it’s done when you insert a toothpick into the center and it comes out clean. If you want to make these as muffins, they should bake up in half the time – use the toothpick trick on those as well. I just set the timer every 15 minutes and checked each time to see if everything was done. Let the bread / muffins cool in the pan for 10 minutes, then remove and enjoy (spread on some butter for a little extra richness)!